Kelly’s initial attack on Hill Two is repulsed. The 43thrd Alabama of Gracie’s Brigade charges Snodgrass Hill. 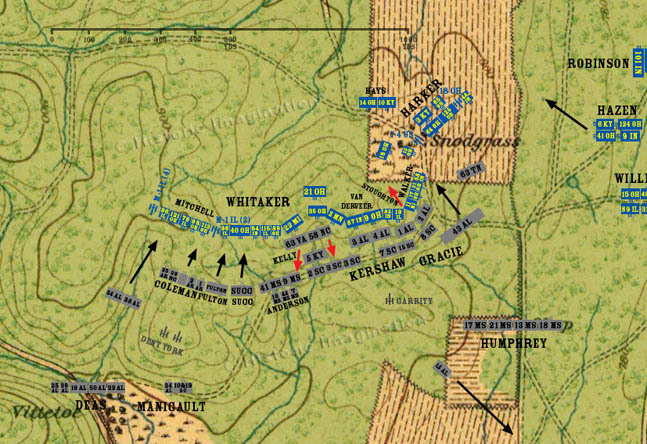 The 1stst and 2nd Alabama Battalions force Stoughton’s brigade from the crest of Hill One in fierce hand to hand combat. The Federals retreat about 30 yards to the opposite crest, creating a no-man’s land on the summit. Johnson’s Division launches its third attack on Horseshoe Ridge. This attack is a slow, methodical advance. Groups of men go from tree to tree using whatever available cover they can, applying continuous, relentless pressure against Steedman’s equally exhausted men.